Concrete mixed on-site is a superior quality product and can be made to the exact specifications every time. Measure and mix on site – because the concrete is made at the job site, the water/cement ratio is always exact. Cost effective – save money because customers only pay for what is used, eliminates shortages and overages. More admixture flexibility – standard mixes comparable to ready mix are exact and precise but you can also offer a wider range of applications that will always be fresh and maximum strength. 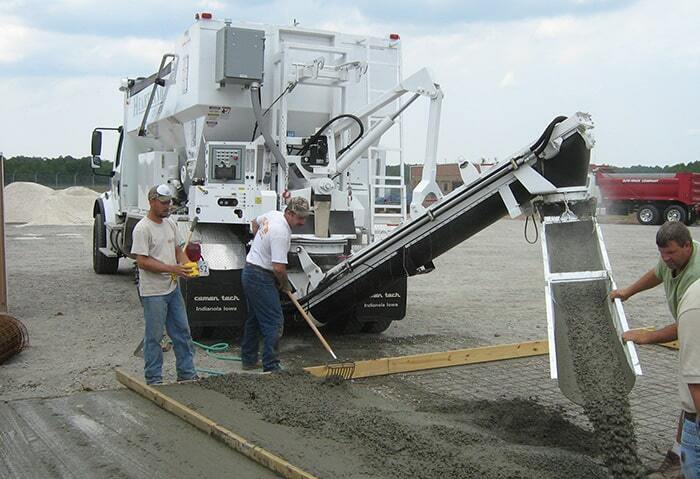 Any size of job can be fresh – volumetric concrete mixers can provide on demand product for jobs from 2 yards to 400 yards per day. We all know the basics of how concrete is made – inert materials or aggregates, cement and water mixed together make concrete. However, the results of the chemical reactions between water and compounds in cement begins immediately after the mixing of the ingredients. When ready mix concrete is mixed at the batch plant your concrete materials has already started the curing process during the travel time which minimizes the available finishing time and in many cases if a truck is detained or late water needs to be added at the job site which reduces the end product’s strength. Concrete produced by a mobile volumetric concrete mixer will always produce the freshest, strongest end product for each and every job.